How Big of a Role Do You See Predictive Analytics Playing in Business Processes? Resolved How Big of a Role Do You See Predictive Analytics Playing in Business Processes? Business process directors who don't apply predictive metrics to cross-boundary business processes will leave their organizations vulnerable to the risk of failing to execute their business strategies. This is because they are unable to anticipate how well critical processes are driving strategic business outcomes, and therefore are unable to make well-informed decisions and intervene when process performance has plummeted below acceptable levels. Here's the thing...as the world digitizes rapidly, we have more and more predictive capabilities. That gives us far more opportunity to define processes based on in-the-moment information than ever before. We built standard processes because flexibility was painful and costly. Today, more and more, inflexibility is painful and costly. Keep waffling between "+1'ing" this and "-1'ing" this. In theory, sounds great, yep, that's the way it should, would, hopefully work. Unfortunately, in reality? Not so much. In an optimistic world, the knowledge provided by using predictive analytics should help business drivers make better decisions about where to move their business. Many times business owners are tempted to use the shotgun approach to solving problems. This costs money and more often than not wastes time. Using predictive analytics will assist business managers in taking a surgical approach to finding root causes and addressing those root causes. Predictive analytics use historical data to derive a prediction of future events. The result of a "predictive analytics" decision is a measure of probability, not a fact. There will always be some small number of processes where probability isn't good enough: decisions in these processes will either be deterministic (driven by black or white rules) or deferred to human judgement. Increasingly, however, predictive analytics will become a vital part of most of our business processes. There are cars on the road in Nevada and California that are being driven, at least in part, by predictive analytics. People may just think of these as really smart machines, but a good part of the algorithm that makes them smart is analyzing massive amounts of data to get to predictions. Culturally, we will accept this level of computer intelligence just as we have come to accept the connected world created by mobile devices. 1) Predictive analytics drives the process. Many marketing processes are here already. Predictive analytics determine which offers a customer sees, which adds show up on websites, etc. These may seem like decisions out of context, but to a marketer, these predictive decisions are driving the very important process of the "customer journey." 2) Predictive analytics and rules drive the process. In this example, predictive analytics is governed by rules. We are seeing this with a number of process that involve risk analysis (selling credit products, increasing lines of credit, etc.). Analytics provide key insight, but are the probabilistic is governed by the deterministic: black and white rules provide gates where credit scores or debt-to-income ratios may override the predictive analysis. 3) Predictive analytics advise the human actor. I think this is the area where we will see the greatest growth in predictive analytics. We are seeing customer service agents advised during customer interactions by customer value calculations or retention budgets calculated via predictive analytics. We are seeing engineers who are using predictive analytics to triage root causes early in the incident management process. This sort of assisted-driving mode, where the human still has room for judgement and in the moment decisions is where I think many of our more dynamic processes will be going. We all know that the past does not predict the future, but there are things that can be learned from the past if considered wisely and applied in the right analogy for future decision. This is not a mathematical function that depends on the amount of data being processed. Root causes are found by intelligent people and not by software. Software can never find a WHY! 'Predictive analytics for BPM' is an oxymoron concept. Either we have the process analyzed properly then it will be executed as defined and succeed. What do you want to predict?`If the process is wrong then the predictive analytics cannot tell you that because there is not right process and its data to compare too. Predicting business outcomes related to a process by s is an illusion or actually it is a misrepresentation and lie. That is not possible. You can't see or analyze what you do not know. Process mining as a 'predictive capability' is nonsense, because you do not need to mine a working process. For what? You can't deviate from a prdefined process. And if you do you do it outside but there is no logical link between the email and the failed process. Once it fails you know and there is no need to predict anything either. Automated process pattern analysis only make sense in ACM in which all actions and tasks are within a homogenuous environment and the users are free to perform as necessary. Then there is the problem of the business trusting the pattern analysis. We can only identify that performer roles set actions related to certain events and patterns. There is no why either, but we can report that observation and make a probable recommendation. There is nothing to predict, because we just learn from user knowledge and share it with less experienced people. All this has to happen in real-time with no intermediate data processing and knowledge engineering otherwise it is pretty useless. Below is a fragment from my book about how to use business processes to predict nonrespect of the SLA by a particular process instance. One of the possible interpretations of performance information is a proactive control of the SLA. As any process is a service, so it has to have an SLA, e.g. an agreed execution time. Typically, process engines are good for generating an alarm (e.g. an e-mail) that a particular process instance took more time than that agreed. But this is not sufficient because it addresses the effect and not the cause. 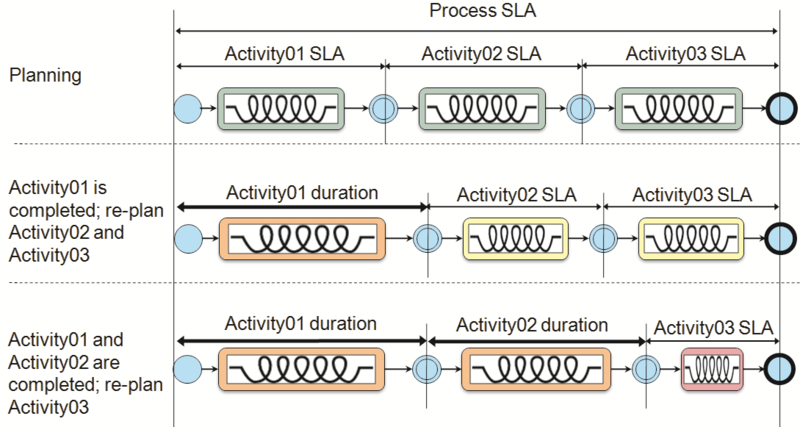 The imposition of a fixed SLA on all activities within a process template leads to a fussy BPM system which produces too many “false alarms”, e.g. if some execution time has been saved at the beginning of a process instance then the control on subsequent activities can be loosened somewhat; alternatively some activities may “catch up” the time lost by some preceding activities. Ideally, the process owners have to be warned in advance about any potential nonrespect of the SLA by a particular process instance. Control points are good places to run “health check-ups” of SLAs. These check-ups should evaluate the current situation and provide proactive control to achieve flexibility in the execution of the complete process, thus really helping business process managers. In addition to the process SLA, each activity is considered as a “spring” with some limits to stretch and to compress. The activity SLA needs to be defined to include both the nominal size of the “spring” together with its upper (stretched) and lower (compressed) limits. Figure (http://www.samarin.biz/misc/atre-KPI-c.png) provides an example of the dynamics of such a proactive control. As completion of the activity “Activity01” took more time than planned, then the SLAs for the other two activities were reduced (i.e. the springs were compressed). As completion of the activity “Activity02” again took more time than planned then the last activity needs to be compressed even more. It may happen that the last “spring” doesn’t reach its lower limit and thus the process instance may be completed within its SLA. Otherwise the process owner has to take some action because this process instance will break its SLA. I may go against the grain here, but I believe the impact of predictive analytics on process management (except for some very specific, big data, consumer-grade or industrial applications) will be extremely limited. I don't believe process management, as a business practice, has enough data points and enough "science" for an analytics engine to routinely extract meaningful enough data in a way that adapts the said practice. Since BPM is not an exact science, a machine-driven optimization mechanism will often fall into local optima traps and miss a plethora of interesting cases. Also, in the context of a BPR project (or strategy / business model change), predictive analytics is as useful as time series analysis is in the context of a black swan stock market event. I respectfully disagree. A large percentage of the "high value" processes in an organization manage customer interactions. Not only could these processes by improved by use of predictive analytics...they are being improved by predictive analytics, today, by organizations across the world. Since many of these customer-driven processes must respond in real-time to changing customer whims, predictive analytics offer a valuable way to turn massive amounts of customer data into manageable insights that service agents--and automated channels--can use to drive optimal interactions. thanks for the comment, but we're not at all in disagreement. I did specify the exception of big data, consumer-grade applications. An obvious example is Amazon - they are actively optimizing the user experience (although I am not a big fan of the site experience) by machine-learning consumer behaviours. But these are rare examples - they are a combination of online, retail, massive presence, significant distribution, logistics and turnover. Yes, in their cases predictive analytics make a lot of sense. It's mostly funnel management (not BPM), still - funnel management is a business process, so yeah. But it's still limited to specific processes and specific BIG applications. I had to look up what “predictive analytics” actually is and here it is per wiki “..encompasses a variety of techniques from statistics, modelling, machine learning, and data mining that analyze current and historical facts to make predictions about future, or otherwise unknown, events” It gives example about credit scoring predicting a bad risk..... immediately turned me cold…..! BUT I find the term “predictive analytics” is vendor analyst “speak” so big NO vote and should be dropped. Let’s try saying in plain business language specifically what is being delivered. I like Dilbert's view! Totally with you that predictive analytics is "vendor speak". I, as customer, was never turned on by such words. This wouldn't be news to any of my customers (assuming it were to be restated in English rather than analystspeak). The trick is to combine (a) a process model with built-in predictive capabilities and (b) the important context of past behavior of a given process. Criterion (a) pretty much rules out BPMN, sorry. Criterion (b) implies that a predictive process, like a person, gains wisdom through experience. If you're not using actual historical process data, well... then Dilbert is right on point. Most of the remarks above are somewhat polarised - either a simple yes or no to the value of process analytics. As with any good process management technique, process analytics can be very effective when focused on increasing performance on the right processes. AND also a waste of time when used on the wrong process. A very dynamic, customer oriented process that needs to be agile and yet reliable, could benefit greatly from process analytics to continually sharpen its performance provided that it is well executed and has the maturity of governance to usefully respond to the additional information. As described in a number of the comments above, there are many examples where much more basic interventions are needed to simplify or harmonise very routine processes. These could just benefit from some of the most basic of process governance disciplines. In these cases, this additional information would be wasted and merely "make BPM professionals richer". The history of the Process Management discipline is littered with silver bullets that would drive dramatic improvements in performance. Some like 6 sigma, quality circles, process engineering, process automation, etc. attracted significant investment as promising initiatives. Having spent time analysing some of these programs, they all go through a similar cycle: 1-Focus on some immediate "suitable" areas and demonstrate good value; 2-Justify and attract additional investment; 3-Grow, delivering incremental value; and then 4-Overstay their welcome and apply themselves to areas where they are not really suited. Good process management is critical to ensuring execution excellence in the next decade. We need the ability to apply the right intervention, from the bag of excellent techniques, to the right problem. Segmenting processes and applying the right level of governance and interventions will is the key to the answer. Its all part of creating, an ever maturing, Business Process Management Discipline. SO - Is process analytics useful? It depends!! I see predictive analytics playing a critical role in manage by business processes. From analysis of patterns of internal behavior (internal processes) in conjunction with patterns and trends of market behavior, strategic adjustments may arise, which must be translated into the critical processes of strategy execution. Inclusive, internal predictive analysis may be more effective and conclusive, if used the concept of Process Intelligence, which is the collection and analysis of data combined with the procedural instances that lead to these data, which allows one to perceive deviations from the business objectives, with greater accuracy and advance, and act accordingly, in a dialectical cycle between strategy and processes. As business processes, I include their own structure, business rules, operational risks, people, skills, support systems, etc..
Allthough current tooling might offer some 'prediction capabilities', I think it's still reacting on current data based on patterns of the past. That is not wrong, but it's not predicting I think. Someone used the metaphor of 'self thinking' cars. They help you to prevent accidents. But they don't predict. They just apply current data on a large amount of rules and react on that. And that really is nice of course to prevent us from accidents. But calling it prediction is too much honour, I think.